These jackets are all multicolor but you may choose the main color of the jacket. Hippie clothes. Bohemian clothing. Artsy clothing for expressive people! Presenting classic gypsy hippie bohemian shabby chic styles for creative people. Handmade boutique styles at affordable prices. 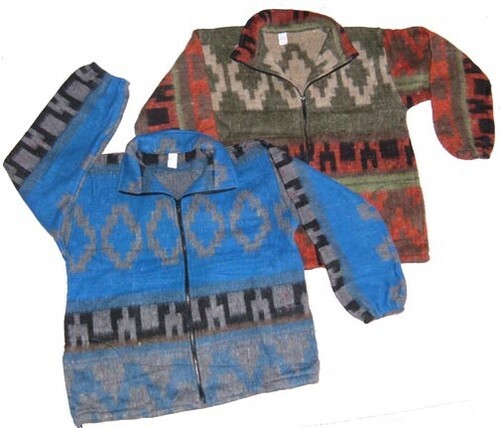 This is a traditional handmade Mexican Indian Blanket jacket. It can be worn by both men and women. It is made of an 50 %Acrylic, 40%Polyester, 10%Cotton Blend of materials. Zip front, 2 side pockets, elastic cuffs, drawstring hem. The elastic cuffs and drawstring hem help to keep the cold out. This jacket is very thick, heavy, soft and warm. It feels just like wearing your favorite blanket. Check the measurements below.